This recipe is a holiday tradition in our house. 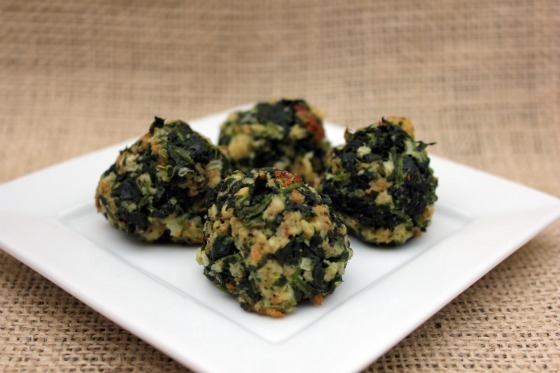 I have been making these spinach balls for at least 20 years and they always make an appearance around the holidays. I usually serve them at our annual Christmas party, but they make a tasty hors d'oeuvre for a New Years Eve party too. I often cut this recipe in half if I am serving several other appetizers. I use two eggs when I do this and half of each of the other ingredients. Give them a try and let me know what you think. Cook spinach according to package; drain and squeeze out all of the water. Shape into balls. Bake at 325 degrees for 15-20 minutes on a lightly greased baking sheet. oh wow...these have new years eve all over them. thank you for sharing...i'm going to make them!